1.Preheat oven to 400°. Spray baking dish with nonstick cooking spray. 2.In large skillet, heat tomatoes, tomato paste, Italian seasoning and garlic powder to simmering over medium heat, breaking up tomatoes with side of spoon. Reduce heat to medium-low; simmer 10 minutes or until slightly thickened, stirring occasionally. 3.In shallow dish, whisk flour, salt and pepper. In separate shallow dish, whisk eggs; place breadcrumbs in third shallow dish. Dip chicken in flour, then in egg, then in breadcrumbs, patting lightly so breadcrumbs adhere. 4.In large skillet, heat oil over medium-high heat. Add chicken and cook 5 minutes or until golden brown, turning once halfway through cooking. Transfer chicken to prepared dish; spoon tomato sauce on and around chicken. Evenly top chicken with ham, if using, and cheeses. 5.Cover dish tightly with aluminum foil; bake 15 minutes. Uncover and bake 5 minutes longer or until internal temperature of chicken reaches 165°. Serve sprinkled with basil, if desired. 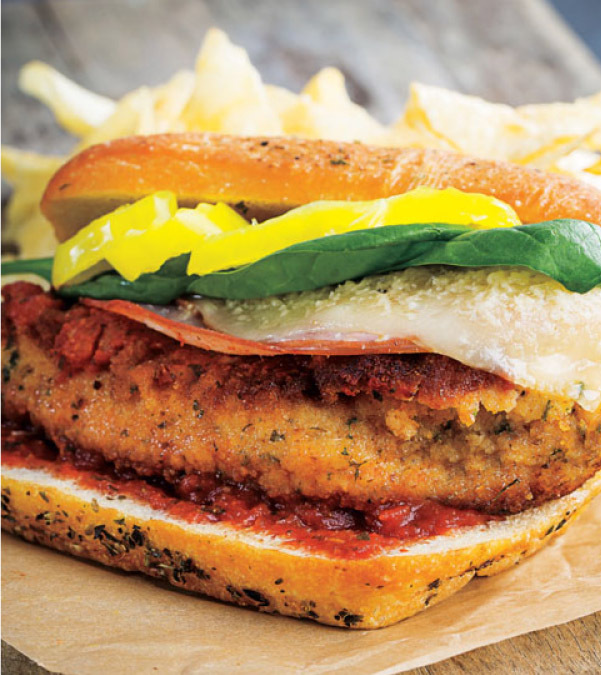 > Make a Chicken Parmesan Sandwich – top the bottom of a ciabatta roll with some of the tomato sauce, a piece of the Chicken Parmesan, ham, fresh baby spinach, banana pepper rings and the top bun. > Serve alongside cooked linguine or spaghetti and steamed fresh broccoli.